The wave of teacher strikes was a bright spot for the U.S. Left in 2018. Although it was provoked by the tragic school shooting in Parkland, Fla., the March for Our Lives kicked off a new wave of student activism. Gun control—at the core of this movement—is a worthwhile goal, but its impact reaches even beyond this single issue, as 2018 saw youth political involvement surge. A record 31 percent of youth turned out to vote in the November midterms, Teen Vogue reports. The prior record for youth vote during a midterm election was just 21 percent in 1986. Young people are also attending more demonstrations and protests. Nearly 20 percent of Americans say they have attended a protest since 2016 and there were more demonstrations inMarch (when the March for Our Lives took place), April and June than in any other month since Trump’s inauguration. While these gains may not all be directly connected to the March for Our Lives, it’s clear that the movement has inspired Americans of all ages and backgrounds to increase their political involvement. While students walked out of their classrooms across the country to protest the scourge of gun violence, teachers were preparing their own disruption. A 13-day strikeby West Virginia teachers, which won a 5 percent pay increase, launched a cascade of actions around the nation. Teachers walked off the job statewide in Oklahoma—where a 1990s-era ballot measure makes raising taxes prohibitively difficult, and where nearly 20 percent of schools are only open four days a week. Another statewide teacher strike followed in Arizona in April. 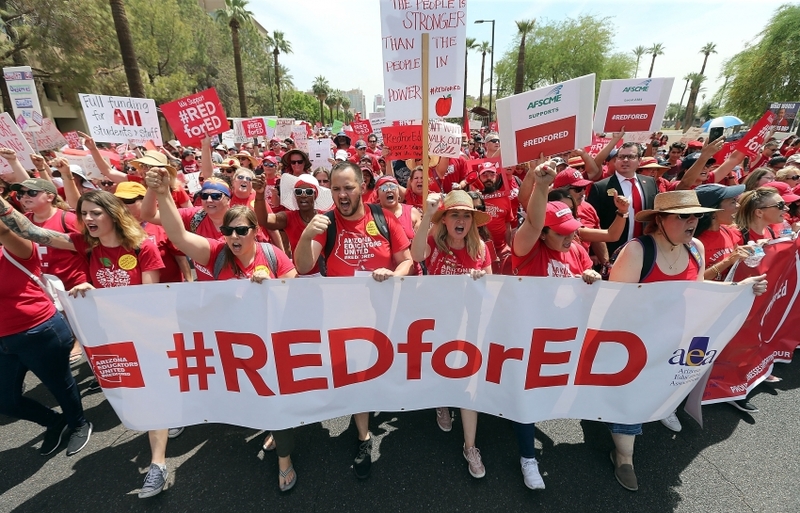 Colorado, Kentucky and North Carolina also saw strikes in numerous counties, and Los Angeles teachers ended the year with a march of 50,000 people ahead of a citywide strike set to begin January 10. Look for the wave to keep spreading in 2019. The October killing of journalist Jamal Khashoggi by Saudi Arabian agents in the kingdom’s consulate in Istanbul was a tragedy the made headlines across the globe. And while the Trump administration offered a nonchalant response to the murder, the U.S. president’s refusal to take meaningful action provoked a bipartisan backlash against U.S. policy towards Saudi Arabia. This helped lead to a historic Senate rebukeof the Saudi-led and U.S.-funded war in Yemen, which has claimed thousands of lives and led the country to the brink of catastrophic famine. Although the House didn’t follow suit, a new Democrat-led House could well do so in 2019. Being a member of the Trump administration has never come with much job security, and in 2018, even more corrupt officials were forced out of the White House by popular pressure. EPA head Scott Pruitt was made to resign in July after his bizarre scandals threatened to sink the administration’s vindictive environmental agenda. Likewise, the ousters of oil mogul-turned-Secretary of Defense Rex Tillerson in March and Interior Secretary Ryan Zinke in December are worth celebrating. While the November firing of Attorney General Jeff Sessions threatened the integrity of the investigation into Trump’s Russian connections, it also meant there would be one less racist in the Department of Justice. Activists worked tirelessly this year to repeatedly draw attention to the corruption of major Trump officials, and their work paid off. Progressives such as Alexandra Ocasio-Cortez, Deb Haaland and Rashida Tlaib show how insurgent candidates can push the whole party left. Here's what progressives should take from the wild 2018 midterms. The Blue Wave that wiped out the Republican House majority brought a number of surprises in heavily GOP districts: Kendra Horn now holds a seat in deep-red Oklahoma, and Joe Cunningham pulled through in South Carolina. But even as Democrats seemed to win House races everywhere, many candidates upon whom progressive organizations staked big bets came up short. Randy Bryce (Wis.), Jess King (Pa.), Liuba Grechen Shirley (N.Y.), Ammar Campa-Najjar (Calif.) and Leslie Cockburn (Va.), all contesting red seats and endorsed by insurgent progressive groups, lost. One reason is simple: They were in tougher-than-average districts. But the other problem is strategic: Backing bomb-throwers in purple and red districts is not how to pull the party left. Progressive organizations simply don’t have enough money, media or organizers to aggressively contest primaries in both blue and purple districts. 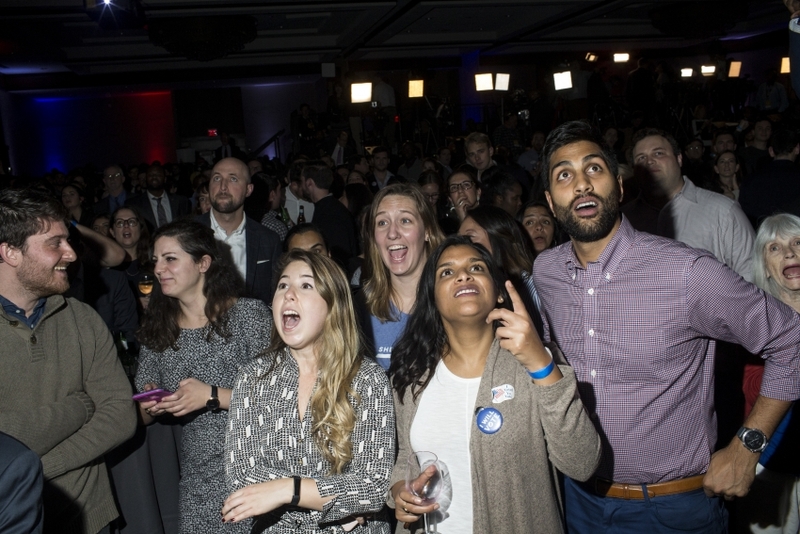 One theory of change guiding some campaigns this cycle has been that an unapologetic left platform could boost turnout and win over working-class voters in Republican areas where Bernie Sanders performed well in the 2016 Democratic primary. The problem, of course, is that Bernie was running in the Democratic primary—his success doesn’t tell us what general election voters want in these districts. This is not to say that a Medicare-for-All candidate cannot win, simply that Democratic primaries offer the best hope to get insurgent candidates in office and pull the party left. To see why, merely count the unabashed progressives who won primary challenges in safe Democratic districts, then sailed to victory in the general election: Alexandria Ocasio-Cortez (N.Y.), Deb Haaland (N.M.), Chuy Garcia (Ill.), Rashida Tlaib (Mich.), Jahana Hayes (Conn.), Joe Neguse (Colo.), Ayanna Pressley (Mass. ), Ilhan Omar (Minn.). Only one retiring Democrat, Rep. Collen Hanabusa (Hawai’i), was replaced by someone who is likely to be to their right. Meanwhile, no progressive who unseated a Democratic congressional incumbent in the primary went on to lose the general election. Look also, for instance, at how Ocasio-Cortez has already shifted the conversation around a Green New Deal, which an increasing number of Democrats have now embraced. Run left candidates to seize the safe blue districts, and the mainstream of the party will follow. It’s tempting to shrug off the question of purple districts versus blue districts with a dismissive, “Why not both?” But progressive organizations simply don’t have enough money, media or organizers to aggressively contest primaries in both blue and purple districts. This will be even harder in 2020, when the presidential election is sure to distract from down-ballot races. Support for these blue-district insurgents will come from unexpected places. Among the Left, there has been some dismissiveness toward the anti-Trump Resistance, as represented by groups such as Indivisible and Swing Left; many have painted them as centrists averse to challenging Democrats. This myth (often rooted in misogyny—the Resistance is predominantly women) does not find support in research conducted by Data for Progress, the think tank I co-founded. We found that Democrats with favorable views toward Indivisible, compared to Democrats as a whole, are more supportive of contested primaries. This finding makes sense: These groups are full of engaged voters who vote in primaries and are sympathetic to the idea that Democratic leadership should be doing more to take on Trump. A glance at the Indivisible endorsements points to an organization unafraid to support anti-establishment candidates. In New York, six state senate primaries were led by Indivisible and other Resistance groups. Indivisible led an upset by a grassroots favorite, Dana Balter, over the favored candidate of the establishment-friendly Democratic Congressional Campaign Committee, the House Democrats’ fundraising arm. While many progressive organizations struggle to have a genuine local presence (and increasingly struggle for money), Resistance groups could be an important base for primary challengers. Although many progressive campaigns lost in swing districts, there is no reason why red-to-blue candidates can’t support Medicare for All. One recent poll of five swing districts found that single-payer healthcare had net positive support in all of them. As progressives gain electoral power in deep blue districts, they’ll be pulling the party toward public opinion, not away from it. Most red-to-blue Democrats, those who flipped Republican House seats, supported some guarantee of universal healthcare, a public option, or even Medicare for All, like Sean Casten (Ill.), Susan Wild (Pa.), Josh Harder (Calif.), Katie Porter (Calif.) and Haley Stevens (Mich.), all of whom won in suburban swing districts. Four years ago, only one of these five districts had a pro-single-payer Democratic candidate in the general election. They weren’t the insurgents that many on the Left were most excited about, but their platforms show that insurgent ideas are gaining ground. To keep the party moving left and advance progressive policies, we need a solid backbone of at least three dozen left progressives in the House to hold the line. That means in 2020 running primary challenges in safe Democratic seats with a slate of young, diverse progressive candidates. For a limited time, anyone who makes a donation of $5 or more to In These Timeswill get a free copy of Verso's best-selling 2019 Radical Diary and Weekly Planner.